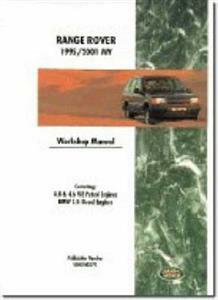 Official Workshop Manual containing comprehensive instructions on repair and maintenance. Covering 4.0 & 4.6 V8 Petrol & BMW 2.5 Diesel Engines. This manual has now been updated and includes three supplements: 4.0 & 4.6 litre V8 Engine Overhaul Manual LRL 0004ENG, R380 Manual Gearbox Overhaul Manual LRL 0003ENG, Borg Warner 44-62 Transfer Gearbox Overhaul Manual LRL 009ENG. part no. LRL 0326ENG BB. 756 pages, 4212 illustrations.